You will be given a reference e-book to read which has 269 pages And the test will be based on that e-book , you can take final test within 1 year of purchase. Communication Skills refers to the capability to convey information to others effectually and competently. Possessing good communication skills at work is all about being able to convey information to people evidently and simply, in a system that means things are understood and performed instantly. It's about transmitting and getting messages clearly, and being competent to read and understand your audience tactfully. Real verbal or spoken communication is reliant on a numerous factors and cannot be fully secluded from other essentialinteractive skills such as non-verbal communication, listening skills and explanation. Human language can be defined as a structure of symbols sometimes called as lexemes and the grammar rulebooks by which the symbols are deployed. The word language also denotes common properties of languages. Language learning usuallyarises most deeply during human childhood. Most of the numerous human languages use configurations of sound or gesture for symbols which facilitate communication with others around them. Languages have a tendency to share definite properties, even though there are exemptions. There is no distinct line in between a language and a dialect. Created languages such as programming languages, Esperanto, and several mathematical formalism is not essentiallylimited to the properties shared by human languages. Communication is a two-way procedure not just one-way. 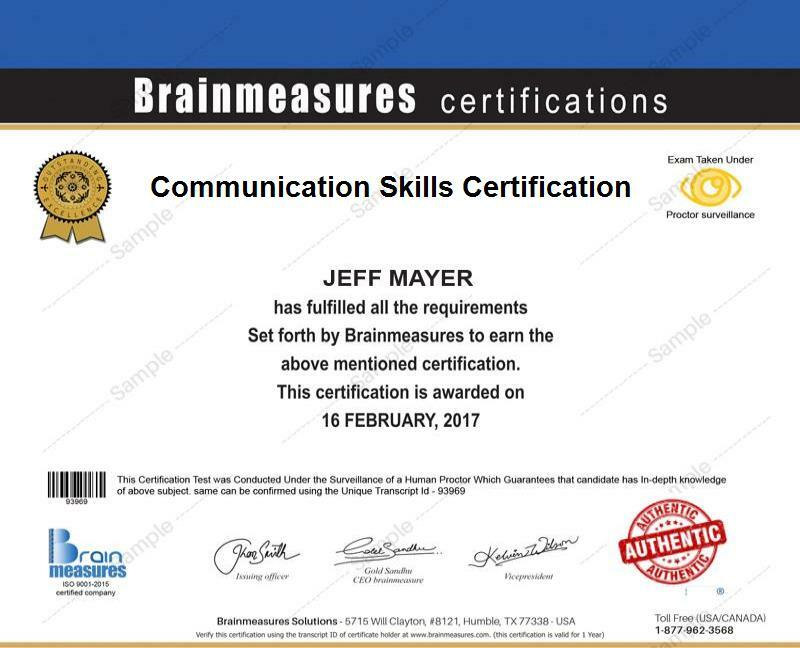 The Communication skills online certification course by Brainmeasures discusses all the significant aspects related to communication skills. Communication is therefore a process by which meaning is consigned and conveyed in an effort to formcollective understanding. This procedure, which necessitates a massiverange of skills in listening, observing, interpersonal handling, analysing, gestures, speaking, questioning, and calculating enables cooperation andteamwork. Misunderstandings can be expected and resolved through interpretations, paraphrasing, examples, questions and answers, and stories of strategic discussion. Written communication can be explained by scheduling continuation discussions on serious written communication as part of the normal way of doing business. Some quality time spent in discussing matters at present will save valuable time in future by avoiding misunderstandings in advance. A frequent method for this purpose is restating what one heard in one's own words and asking the other individual if that actually was what was meant paraphrasing.Brainmeasures is an ISO certified leading online professional certification company renowned for their online certifications and skill testing. After getting enrolled in this course, you would receive an E-book that would guide you for the online exam. Upon successful completion of the exam, you would be awarded the certificate by Brainmeasures. The average salary of a Communications Writer is around $56,000 approximately. Salaries may vary depending upon personal experience and qualifications of an individual. How to hone your communication skills? How to be receptive to others? How to apply your mind and body into conveying your message to others? How to manage communication challenges? How to successfully communicate across distances? The Communication skills certification course by Brainmeasures is really beneficial for everyone since individuals with good communication skills are required in every field, every job role and every organization or business company be it a small organization or a multinational company. In such a competent time when technology is progressing significantly, the need for excellent communication skills has increased considerably and is the basic criterion of selecting candidates in a company for enhanced business dealings and better discussions on future goals and projects of an organization. Good communicators delight in understanding others, self-confidence, leadership, credibility, ability to explain and persuade, personal presence, and fun interaction. Each one of these qualities comforts us to make friends and maintain relationships much effectively and effortlessly. After becoming a certified professional in communication skills, the chances of you’re getting recruited in an established organization increase substantially. Communication play a vital role in one’s overall personality development and success.